"These guys really know how to rock a festival"
One of the lovely things about Womad is those times when you take a chance on an act you’ve never heard of - and it completely bowls you over. 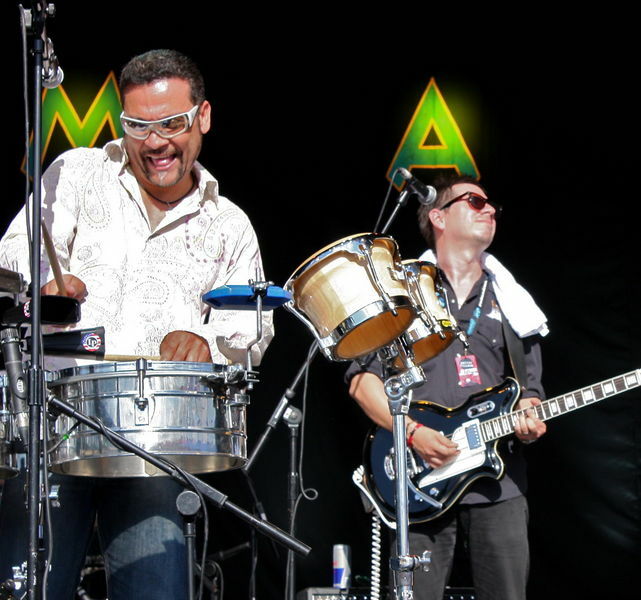 Grupo Fantasma are a 10 piece latin band from Austin, Texas who fuse in elements of rock, funk and R’n’B into their trademark sound. They were playing on the Friday afternoon on the Open Air Stage at Womad facing into a strong sun in front of a huge crowd of curious Womaders. I doubt anyone really knew who they were when they started - but they certainly did by the time they ended! But before they took to the stage a rather avuncular gentleman (accompanied by about 3-4 generations of his family), who I imagine was unused to addressing hoards of world music fanatics, took to the stage in faded custard yellow trousers and addressed the crowd. 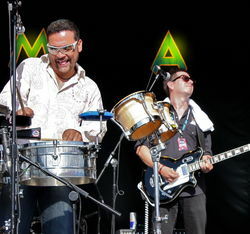 Grupo Fantasma took to the stage and then hit the ground running with a salsa that just hit the sweet spot and didn’t let up on the energy and positive vibes until the end of their set. Excellent! These guys really know how to rock a festival. From a salsa that got the Brits twitching, into a cumbia that got the hips swinging, Fantasma’s effortless groove and easy laid back vibe were the perfect soundtrack to a hot summer’s afternoon. I just couldn’t stop smiling throughout and was desperate to dance even though I was trying to defend my photo pitch at the front of the barrier! Another cumbia followed: “Pachuco Baila Tu Cumbia” which featured a great trombone solo from Mark ”Speedy” Gonzalez and some rich baritone work from Josh Levy. Straight into a track called - I think - “Llevo”, which morphed into a salsa via a fabulous percussive bridge! Wonderful conga solo from Matthew “Sweet Lou” Holmes. Their cumbia style was not the classic cumbias of Colombia and Northern South America, nor the avant garde urban cumbia villeras of Argentina and Chile, but were based on the more poppy Mexican style, I could still hear shades of Selena in there somewhere. However, Fantasma, have developed a style all of their own - a lot of it due to their instrumentation which uses two electric guitars with very different sounds and approaches, a drumkit and a three piece horn section. Mix all that in with rock, jazz and funk licks and chops and a killer groove and you’ve really got something. Would it also make you jealous if I told you that 8 of the band also make up the latin funksters and breaksters, Brownout? Yeah, I thought so. "these guys just dripped quality"
No wonder these guys just dripped quality. We just dripped sweat in the intense heat. As Nicaraguan frontman, singer and timbalero, José Galeano, said: “Wow! It’s hot up here! We’re from Texas and we know what’s hot!” - and he wasn’t kidding. Oh, and would it help if I told you he’s the nephew of the great Chepito Areas (timbalero for the Santana Band back in the Woodstock years)? The guitars (Adrian Quesada and Beto Martinez) seemed to pull in influences from surf, funk, rock, jazz and even space age and Spaghetti Westerns. The rhythm section of Greg González on bass, John Speice on kitdrums, José on timbales and Sweet Lou were bubbling and popping, yet always rock solid. Vocals were shared between José Galeano and Kino Esparza (also on guira). The horns were on fire at times, yet as cool as an ice-cold beer at others. Lots of props to the trombone solos - I was hoping that the trumpet (Gilbert Olorreaga) and baritone sax would have taken more features too, but still, their work together as a unit was a real joy. One of the most enjoyable aspects musically was the use of dynamics, especially when playing the breaks, the whole band moves as one, breathes as one. Tighter than a duck’s backside - and that’s watertight! Now, that’s quality and attention to detail. As well as delicious cumbias and salsa the Texan boys also served up a boogaloo, “Cayuco”, with a tasty baritone sax solo and a bomba (“al estilo puerto rico”) called “Mulato”. They were obviously enjoying themselves - Galeano makes for a great frontman - big smile and an engaging way with a crowd, even a large one like this. It was a truly sun-drenched performance from a classy band. Relaxed, confident and laid back - but with loads of fire and a stonking groove! And it didn’t stop. They’d got us all by the cojones and weren’t going to let go. And then finally, all too soon it was the last number. A track entitled: “Montañozo” from Grupo Fantasma’s latest grammy-award winning album ("El Existential") - a fast cumbia with Spaghetti Western vibe interwoven into it: “giddy up, giddy yap”. It was already fast when it went into the conga solo, followed by a timbale solo, but then sped up even more until the end. "get first in line for the ticket!" Wow. Dancefloor mayhem all the way. An exuberant reception from the crowd, but sadly no encore. Still, what a band. Remember the name: Grupo Fantasma and if they come again to the UK, get first in line for the ticket!